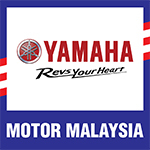 The 2014 PETRONAS Asia Road Racing Championship season finale marked a bitter outing for Yamaha’s Yuki Ito as the Japanese rider missed out on what could have been his maiden SuperSports 600cc title to Zaqhwan Zaidi at the Losail International Circuit in Qatar on Sunday. Zaqhwan was third in the standings with a 22-point disadvantage heading into the final round but was able to secure the championship having finished second in Race 1 and Race 2 as champion thanks to teammate, Zamri Baba who held off all his immediate title rivals. In an intense battle that saw the leaders swap positions on multiple times, Zamri aced Race 1 in 31’37.305s followed by Zaqhwan second and Yudhistira third with 31’37.371s and 31’37.529s respectively. Zaqhwan signed off the season with his second premiere class victory to secure the SuperSports 600cc title in Race 2, wrapping up the grueling 15-lap battle in 31’24.717s while Yuki fought courageously to finish second with 31’25.097s. 31-year old Zamri came in third with 31’25.119s. Retiring Katsuaki Fujiwara completed both races outside top-10 following technical difficulties with his front-end suspension. The final standings had Zaqhwan on top with 170 points, one point ahead of Yuki in second and 15 above retirement-bound Fujiwara third. 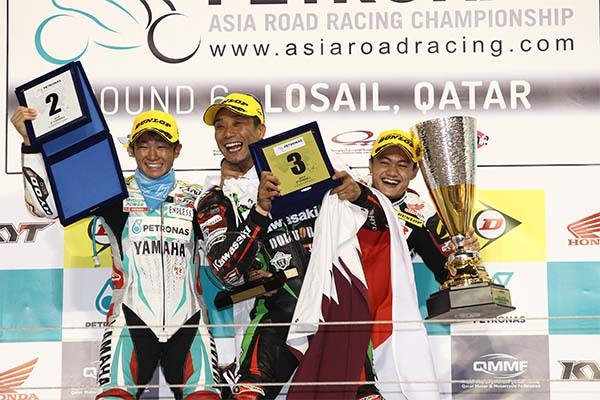 Meanwhile Gupita Kresna became the first Asian Underbone 130cc Champion at the Losail Circuit. The poleman secured the intermediate crown having finished Race 1 in 13th position following a huge collision with Kazuki Masaki on the front straight in the final lap. Both riders escaped the horrific crash uninjured and picked up their bikes to complete the race with Gupita pushing his machine to the finish line. Fortunately for Gupita, closest title rival, Norizman Ismail retired from the race following a broken exhaust pipe and the three points he picked up was enough for him to clinch the title. Gupita’s compatriot, Reza Fahlevy (Faito Factory Racing) won Race 1 in 18’04.320s with Ahmad Fazrul Sham and Rusman Fadil completing the podium steps in 18’04.330s and 18’04.338s respectively. Boosted by his championship win, Gupita went on to secure his maiden victory for the season in a hectic Race 2. In a breathtaking photo-finish, Gupita crossed the line in 18’04.860s, 0.118 seconds ahead of Fazrul Sham with Mohd Amirul Ariff Musa 0.002 seconds behind. It was a superb display of clever race craft by Gupita, who battled a persistent pack. He started the final lap in 15th place, in the slipstream of his rivals and passed Amirul on the fast, sweeping back section and timed his flying finish to perfection. Picking up 28 points from this round, Gupita puts an end to the 2014 Underbone 130cc title chase with 176 points, while Taiga Hada and Amirul Ariff rounded up top three with 127 points and 126 points respectively. T.Pro Yuzy Honda NTS won the Underbone 130cc team award with 180 points followed by Kawasaki KYT Rextor Manual Tech second and Harian Metro Y-TEQ SCK Honda Racing third with 176 points and 163 points.